My latest article for Thanet CAMRA's Ale of Thanet publication covers food and beer pairing with a spring theme. You can check it out below or find the original (for a limited period) here. From the golden ales of summer to the brown ales of autumn and then the dark beers of winter; a year has passed and we complete our journey with spring. We’ve looked at the changing seasons and the way they impact what we drink, pairing great beers with great foods along the way. Spring is about anticipation and expectation; we’re done with winter now, no more snow delayed trains and no more icy walks to work. As the days tick by the evening sunlight teases us with its growing perseverance, that barbecue is in the back of our minds and summer isn’t far away. Springtime is an overlooked season when it comes to beer; not quite summer and not quite winter, it struggles to be defined by an obvious beer style, many breweries choosing just to release their summer blonde ales a month or two early. Good food and good produce on the other hand begin to come into their own at this time of year, the more eager of the crop can be harvested giving us delicious new potatoes, spring onions and broad beans. One of my favourite things in the world is a bowlful of boiled new potatoes, tossed in olive oil, lemon juice and dill; served warm it’s difficult to beat. May brings us asparagus, that perennial English favourite that just isn’t the same at any other time of year. It’s best served simply, allowing its wonderful natural flavour to take centre stage. Snap off the woody stubs, boil in salted water for four minutes or until tender with a slight bite and serve with a generous knob of butter. 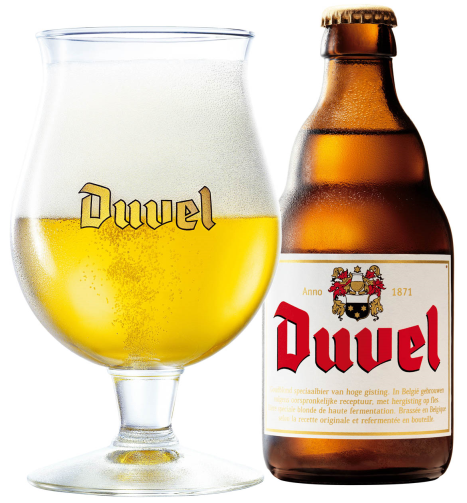 The classic beer accompaniment is a Belgian Tripel or strong golden ale; Duvel is a great example of the latter and is widely available in supermarkets. At 8.5 % ABV it’s an intense beer, strong alcohol notes combine with peppery, spicy noble hops and a firm bitter finish. There’s a sweetness up front in the beer that’ll find the natural sweetness of the asparagus, the abundant carbonation balances out the heaviness in the beer and helps to cut through the butter. Noble Saaz hops have a delicate herbal quality to them, almost vegetal when used in large quantities; this is a perfect match for the food and paves the way for the bittersweet bridge between the food and the drink. There’s a complex simplicity about this pairing that I just love, it’s unfussy, it just works, but it offers more every time you come back for a mouthful. Duvel is available at all good off-licences and bottled beer shops. A 330ml bottle will cost in the region of £2.50. Quite frankly, I’d feel a complete and utter fraud if I wrote an article about spring food but didn’t include lamb. And, whilst not certain, I’m pretty sure that when eating lamb it’s a legal requirement to have mint sauce and roast potatoes. People have been convicted for far less serious crimes to good food. How do you pair a beer with something like mint sauce though? Something so brash, with its sugary sweetness, tart acidity and menthol tang? It would take a big beer to stand up to that, but with something full-on you risk swamping the food or adding one flavour too many and making the whole meal feel muddled. I think a lighter beer is the best way to go, something that’s clean and simple and refreshing but has enough about it to make itself known. I like Wells and Young’s London Gold for occasions such as this. It’s a top fermented, bottle conditioned beer, but by the time it hits the glass it feels somewhere between an ale and a lager. Sporting notes of hay and bread crust it has a zingy citrus tartness to it and a crisp, snappy bitter finish. It’s full of flavour without being full-on, and it has a palate cleansing quality that I think makes it great with strongly flavoured food. Wells and Young’s London Gold is widely available. A 500ml bottle will cost around £2. A final offering, a personal favourite, crab cakes with chili and coriander. Fresh crab meat begins to come into season at this time of year and, whilst it can be difficult to find, it’s worth the effort to track down over tinned. If you don’t like the idea of buying live crab, a good fishmonger will happily sell you a dressed version. I combine this meat with some seasoned mashed potato, thinly sliced spring onion, chili and plenty of fresh coriander. Use an egg yolk to bring the mixture together and form into cakes in your hands. Dust each side of the cakes with some plain flour, gently fry in standard olive oil until golden brown and serve with a generous dollop of mayonnaise and some rocket leaves. I like this with a bottle of Brewdog 5am Saint, an amber ale from the Scottish brewers that’s packed full of new world hops. It has a toffee and caramel malt background that works with the natural sweetness of the crab; then overlaying that sits a wave of jammy-sweet tropical fruits that will find the fruitiness of the chili, before a crisp, bitter finish that will cut through the food like a squeeze of citrus. Brewdog 5am Saint is available at selected Sainsbury’s shops. A 300ml bottle will cost around £1.90. I love good beer and I love good food; when the two come together they can make for delicious results. Hopefully this seasonal series has showcased a few great combinations and made you think about the beers you drink with the food you eat. Its versatility, accessibility and variety makes beer the greatest long drink in the world, I think that’s something we’d all agree on. Let’s celebrate and enjoy beer throughout the year, not just when in the pub or at a festival. Set another place at the dinner table, a place for good beer. Hmmm Crab cakes with chilli and corriander, sounds wonderful, just nicked that recipe...and 5am Saint too, marvelous. Only recently tried Brewdogs bottled beers but I ahve to say that I now always add a cople of bottles of Punk and 5AM Saint to the trolley. They are going to be my cold beer of summer methinks..
Let me know what you think! I love the combination. it is one of the good post. i like this a lot.